A US government watchdog has called for three officers to be disciplined after the Pentagon spent $36 million on constructing a command facility in Afghanistan that was unused by any troops. John Sopko, the Special Inspector General for Afghan Reconstruction (SIGAR), issued a report Wednesday on the construction of the 64,000-square-foot command-and-control facility at Camp Leatherneck in Helmand Province, Afghanistan in 2010. The need to build the facility was justified under plans by President Barack Obama’s administration to increase the number of US troops in Afghanistan. The building was completed in April 2013, despite requests from some senior Pentagon officials to halt construction. 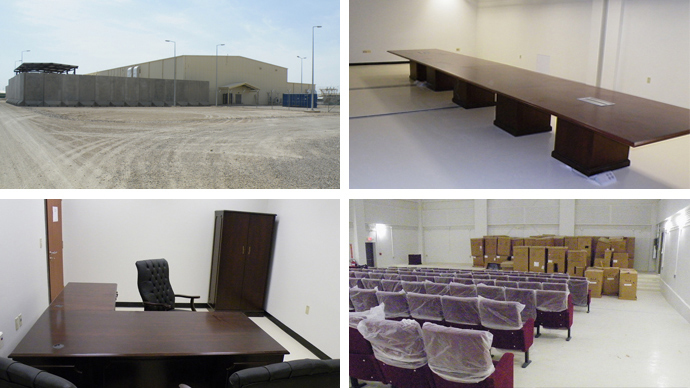 According to the investigators, who visited the site, the facility was “well built” and equipped with new furniture. However, by that time the US had already begun to withdraw its troops – so there was no need for it. "Ultimately, construction of the building was not completed until long after the surge was over, and the building was never used," the report said. The Afghan Army, which has taken over security duties from US-led forces, is not currently using the building. There were various proposals for the facility, including transforming it into a movie theater and fitness club. Sopko, the special inspector general, published a letter calling for an inquiry into the case in July 2013. The Department of Defense conducted two investigations, accusing those responsible for the project of corruption, as the facility allegedly cost $25 million, instead of $36 million. But nothing followed the inquiry. “When it was clear this building wouldn’t be used, and when three commanders requested its cancellation, the Army not only built it anyway but completely failed to hold any officials accountable after all the facts came to light — so I’ll now be fully expecting answers from the Army,” McCaskill said, McClatchy DC reported. SIGAR recommends holding to account three US officers: General-Lieutenant Peter M. Vangjel “in light of his decision to construct…building over the objections of commanders in the field, resulting in the waste of $36 million,” Army Major General James Richardson because of his “failure to carry out a fulsome investigation” and Army Colonel Norman F. Allen for his attempt to "discourage full cooperation" with the report. Wars in Iraq and Afghanistan have witnessed many cases of misuse of money by the military. For instance, a police base in an Afghan village built, which cost $500,000 from the US military budget, fell apart four months after completion because of faulty construction. The US has the largest military budget in the world – in 2016 it plans to spend more than $600 billion, and some experts believe that even this figure is underestimated.